If you are a website owner, backup is an important thing you must put in the first priority. Today, I have a good news for you. I am going to share my experience when using the eBackupper service. You may haven’t heard about this online backup service yet. But, this online backup service offers a simple and easy way to backup your website and databases to Google Drive, Dropbox or One Drive. Don’t worry, more cloud storage options will be added soon. eBackupper is a free online backup service (a software as a service or SaaS). They offer a free way to backup your website data as well as the MySQL databases to your own cloud storage. Currently, three main cloud storage are supported: GDrive, Dropbox and One Drive. It has a simple web interface where we can configure our backup tasks, sources and backup destination. Login to the web interface and then click Website backup tab to start configure your website to backup. There are two protocols you can choose FTP and FTPS. Click the + button to start adding a new website. Enter your website details here. Click Connect to complete the step. Currently, eBackupper only supports MySQL database. But they promise to add more database servers to their service in the future. I would expect to have PostgreSQL database support. 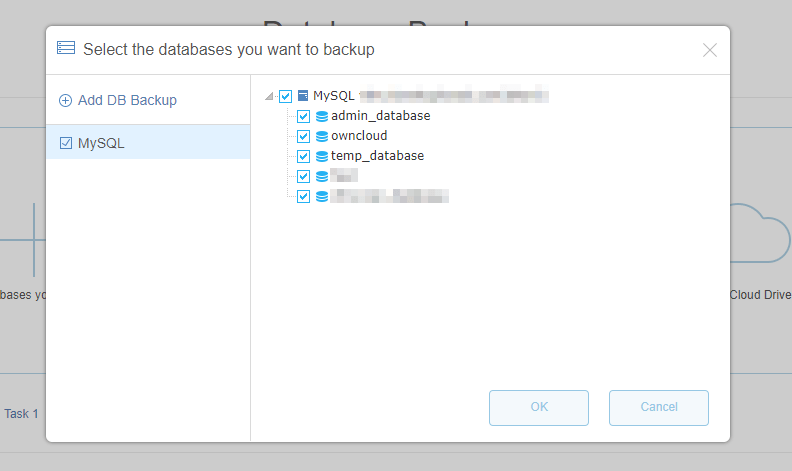 To backup MySQL database, simply connect your database server with eBackupper. If you want to backup your MySQL Databases, you will need to enable remote access to your MySQL Server. Please read my tutorial to enable remote access to MySQL. As we mentioned above, eBackupper currently supports three cloud storage: Google Drive, One Drive and Dropbox. eBackupper is a promising online backup for website owners. It is great to be able to store the backup in our own cloud storage. While other online backup provider charge a monthly fee, eBackupper is available for free (at least until now). Don’t forget to check out their website and try their great service. Forget about a complex task to backup your websites and databases.